Academic pricing is available only to proven facilities, educators and students. Please fax or e-mail proof of status to JRR Shop. The LinearPhase PEQ Orange does not shift the phase, it just boosts or cuts the amplitude in a given frequency range. Now you can apply much more boost without changing the sound character of your recording. Due to proprietary low-noise design in the time domain the distortions (THD+N) are extremely low ensuring crystal clear, neutral, and uncolored sound. The LinearPhase PEQ DirectX PlugIn is unique in the world of audio components. Almost all parametric equalizers being used are implemented with filters that accomplish phase shift, e.g. the original signal is remixed with its phase-shifted version. Because the amount of the phase shift is frequency dependent some cancellation or amplification at certain desired frequencies takes place. It works, but with a major disadvantage - the different signal components are spread all over time, so that the time relationship between harmonics in the processed signal is heavily affected. The result is that a nice sharp bass drum becomes slurred and muddy and vocal tracks become strident or brittle. Algorithmix® is proud to offer you a true remedy against difficult equalizing tasks, the LinearPhase PEQ PlugIn, a linear-phase equalizer which can be handled exactly like its classic predecessors, but cannot be "heard". The LinearPhase PEQ successfully copes with sonic problems that cannot be solved with any classical equalizer without side effects. You can boost lower frequency regions by even 10dB without mud or slush and with no loss of transients at all. You can remove the sibilance from a vocal with a sharp notch without affecting the whole mix like occurs when using analog or IIR-based digital EQ. LinearPhase EQ better preserve the time relationships of harmonics in the original waveform. This translates to smoother top end, sweeter and bigger midrange, and a clearer more distinct bottom end as compared with phase-shifted EQ. The resultant sound seems less processed, more like it occurred naturally in the air in front of the microphone. The mixes become clear and transparent, the instruments more defined and "realistic". 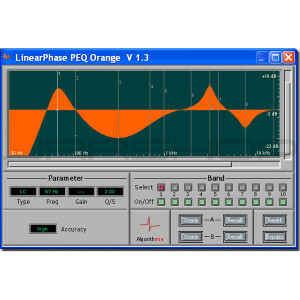 The LinearPhase PEQ Orange works in the time domain. It analyzes more critically than LinearPhase PEQ Red and therefore is especially recommended for difficult mastering and re-mastering tasks.